I saw this idea in a magazine I picked up at a liquor store. I was all excited to try this new recipe, then started reading it and it wanted me to cook the artichokes, and the sauce, well frankly sounded horrid. So I used seasoned artichoke hearts and took their idea of, what sounded like, a cold oily lemon caper sauce and made a warm lemon caper cream sauce. 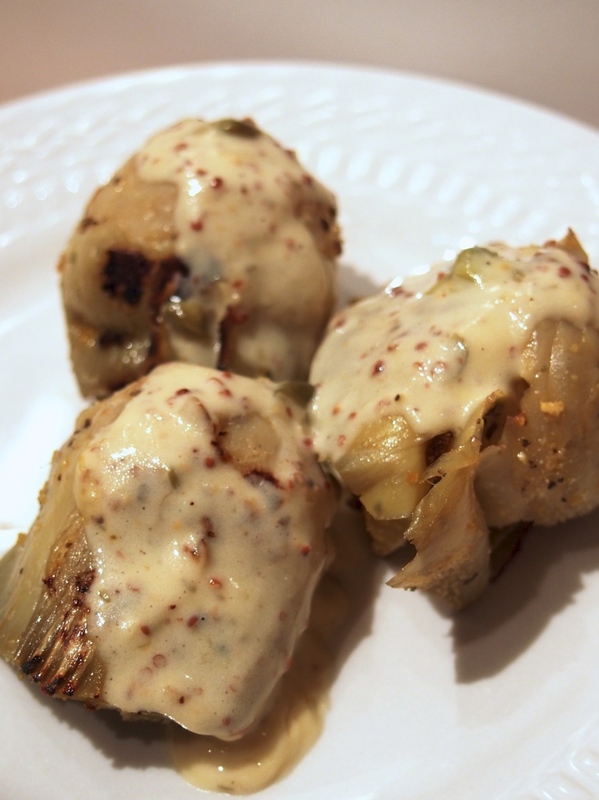 Drain the artichokes and pat / squeeze dry with a bit of paper towel. Toss them lightly in olive oil, seasoning with the vegeta, lemon pepper, and garlic powder. Add the capers, lemon juice, and dijon mustard and whisk to blend. Add the cream and whisk to mix, let simmer until it begins to thicken, whisking occasionally.